The first Boeing 737-800(W) for the “new” Eastern Airlines was rolled out of a paint shop at Shannon, Ireland on November 4th 2014. It is, apparently, to be delivered to Miami by the first week of December, and will be used to complete FAA certification of the “new” airline. The first aircraft is registered N276EA and named “Spirit of Captain Eddie Rickenbacker”, it is the first of 10 ordered by Eastern. Photo by Malcolm Nason, see the full article here. Personally, I think it’s great that Eastern has chosen to resurrect the classic scheme, and I am particularly happy to see they have chosen the “wide stripe” look over final scheme that saw the two stripes reduced in height, and placed below the cabin window line. Quick off the mark, TwoSix has already announced they are releasing the decal in 1/144 scale (TS44-724) . I am hoping they will also do so in 1/200 scale! 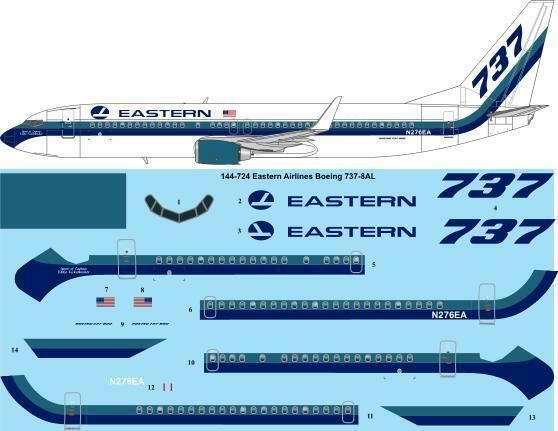 This entry was posted in Civil Aviation News, New Decals and tagged 737-800, Boeing, Eastern AIrlines, TwoSix. Bookmark the permalink. Eastern AL, welcome back to the world and it’s great TwoSix followed so quickly; I look forward to see a 737 in those colours.